AjaXplorer is a free Ajax file manager with powerful features & an user-friendly interface. It is built with PHP (4 & 5) & does not require any database to run. Just an upload & use solution. jQuery is everywhere, its fast and versatile, and is rapidly becoming as common on websites as CSS. The only small problem you may have is keeping up with development, keeping up with new plugins and tutorials. This article will do just that. All of these tuts have been written within the past eight weeks, bringing you up to speed with latest developments. Demo URL : View Demo. Description : A great way of utlizing jQuery to enhance user experience is to not just validate, but to submit your form entirely without a page refresh. 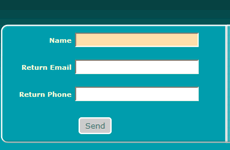 In this tutorial you will learn how easy it is to submit a contact form that sends an email, without page refresh using jQuery. Every day thousands of people take it to the air? With so many airlines to choose from, branding is extremely important and at its core lies logo design. In this article we?ll take a logo at the logos of over 50 popular airlines. The list is by no means a complete list of all airlines and is just intended for inspiration for your own projects. Noteworthy is the lack of any depiction of an airplane in most of these logos, but a tendency to suggest flying through the use of curved shapes that resemble wings. 102 Websites Worth Watching and 40 Web Design Artists. Today we are happy to present to you a new icon set designed by Jojo Mendoza especially for IconsPedia and its readers. Where Are My Money Icon Set brings to you 6 icons at 256×256 pixels ready to be used in your application or website.